The fabled Neelkanth, Shiva, is faced with his greatest challenge. 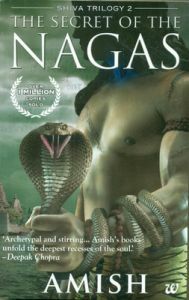 He is forced onto a path of vengeance where nothing is as it seems, in The Secret of The Nagas (Shiva Trilogy). The hunt is on for a mysterious naga assailant who has taken the life of one of Shiva's close associates and now preys on his wife. This thirst for revenge will bring him face to face with the truth behind the mysterious nagas. The nagas are a deformed race of warriors with exceptional fighting skills, whose motives are hidden. They play a central role in a conspiracy that has brought a once mighty kingdom to its knees. And if Shiva is to break the deadlock, he must travel deep into hostile territory, where he will face a deadly adversary. At Kashi, Shiva's wife, Sati, who has recently given birth to their child, stays behind to help the King with an entirely different kind of battle. As Shiva's journey takes him away from her, she will uncover a secret that will change both their lives forever. Will Shiva and Sati's marriage survive, when the line between friend and foe becomes blurred? With a plot that picks up right where the previous book left off, The Secret of The Nagas (Shiva Trilogy) takes you on an exciting roller coaster ride through this epic re-imagination of Indian mythology. The book was published in 2012 in paperback. Key Features This is the much anticipated sequel to the #1 national bestseller The Immortals of Meluha. Read about characters from childhood folk tales as well as never before seen characters, fresh from the author's imagination. A mysterious Naga assailant has taken the life of one of Shiva’s close associate .Shiva is forced to go on the path of vengeance against the Nagas. As Shiva treads into the extremely hostile Naga territory , his wife Sati who has recently given birth to a child uncovers a secret. Sequel to the bestseller Immortals of Meluha by Amish Tripathi. A very interesting retelling of Indian Mythology ! !